Posted by geoconger in Anglican Church of Aotearoa New Zealand & Polynesia, Anglican Consultative Council, Anglican Covenant, Church of England Newspaper. The viability of proposed Anglican Covenant remains unclear, as a request by the Anglican Church of Aotaroa, New Zealand and Polynesia (ANZP) for a legal opinion as to its enforceability remains unanswered, a year after it was requested. Delegates to the May 2010 meeting of the ANZP General Synod/Te Hinota Whanui endorsed the first three sections of the covenant, but adopted a resolution asking for an opinion from the Standing Committee of the Anglican Consultative Council on the “appropriateness of the provisions of Clause 4.2.8 of the proposed Covenant,” which excludes all provinces which have not adopted the covenant from decision-making about exclusion of provinces. On April 27, the Rev. Michael Hughes, General Secretary of the ANZP told The Church of England Newspaper that “no answer yet” had been given. The ACC Standing Committee has now met three times since the ANZP Synod, and Mr. Hughes said he would follow up”on the province’s request. The continuing cloud over the legality of the covenant comes as the ANZP dioceses begin debating the agreement, which seeks to set the parameters of Anglican life and thought. At the 2010 synod, delegates asked the church’s ‘episcopal units’, (the seven dioceses of the Church of New Zealand, the five hiu amorangi or Maori dioceses, and the Diocese of Polynesia) to consider the full covenant and report back to the June 2012 meeting of synod. On April 15 delegates to the hui amorangi of Te Manawa o Te Wheke synod voted to reject the Anglican Covenant. 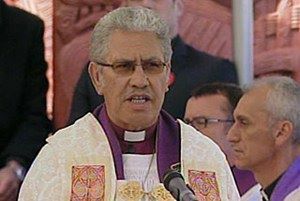 The vote was reported as having been unanimous, with Bishop Ngarahu Katene speaking in support of the motion to reject the Anglican Covenant. The diocese believes “the Anglican Covenant does not reflect our understanding of being Anglican in these islands,” and they added they would prefer the church to focus on internal land disputes and the rights of Maoris in New Zealand rather than on the wider church. If the 2012 General Synod adopts the Covenant, it must come before the Synod a second time in 2014 as a change to the church’s constitution for adoption. However, under the current organizational structure, each Tikanga or section of the church: Maori, Polynesia, Church of New Zealand, has the ability to veto legislation for the whole. Excellent common sense from NZ!I am a frequent visitor and also from Wakefield Diocese – the first to reject this iniquitous covenant in England.